Why should I use a patch instead of taking a tablet? A Transdermal Patch offers dramatically increased effectives as the supplement or medicine bypasses the stomach, liver and intestine and is absorbed directly into the blood stream. Up to 90% of any supplement or medicine taken orally can be lost in the stomach, liver and intestine. Are there any harmful ingredients in Natural Patches? 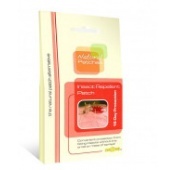 There are no harmful ingredients in Natural Patches, all our patches are natural and proven to be effective. You can wear the patch on any hairless area of your body, we suggest a good place to be under your under garments. Do not use on any broken or infected skin. We suggest each time a patch is applied to move it slightly and not apply to exactly the same area. Can anyone use Natural Patches? If you are pregnant, lactating or using medication we would suggest taking medical advice. 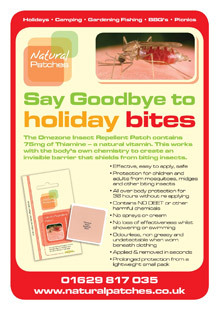 The Insect Repellent Patch can be used by children 12 months and over. All other patches we would suggest 18 years and over. What should I do if I get a reaction to the patch? If you experience any side effects or reaction to the patch we would suggest stopping use immediately. If symptoms persist consult medical advice. Are there any reported side effects of Natural Patches? The only reported side effect that has been reported is skin sensitivity to the adhesive of the patch. However if you are able to wear plasters, you should be able to wear the patch without any problems. The patches do contain Latex. No more than one patch of the same type is necessary, however it is safe to use more than one patch if you find one is not sufficient. If using the Insect Repellent patch and you are over approx 16 stone we would perhaps advise using two patches. How often do I change the patch? With the Insect Repellent you change the patch every 36 hours, all other patches should be changed every 24 hours. Do Natural Patches work for everyone? In theory yes they should work for everyone, however we all know that everyone is different and 100% success on any product is not guaranteed for this reason. How quickly should I expect Natural Patches to work? This depends on the actual individual and the actual patch? The Insect Repellent should start to work approximately 2 hours after application once the body has started to absorb the Vitamin. Most people should feel the results of all other patches in 2-3 days, however it can take up to 4-6 weeks to feel the results. Can I wear the patch whilst swimming or showering? Yes you can wear the patch whilst swimming or showering without the loss of effectiveness. Are the patches safe on children? The Insect Repellent is safe to use on children from 12 months onwards. All other patches we would suggest 18 years plus.